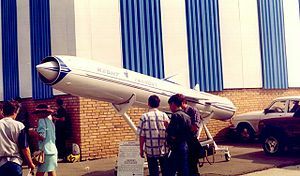 Yakhont/Onyx missile at MAKS Airshow in Zhukovskiy, 1997. The P-800 Oniks (Russian: П-800 Оникс; English: Onyx), also known in export markets as Yakhont (Russian: Яхонт; English: ruby), is a Soviet / Russian supersonic anti-ship cruise missile developed by NPO Mashinostroyeniya as a ramjet version of P-80 Zubr. Its GRAU designation is 3M55, the air launched Kh-61 variant also exists. The missile has the NATO reporting codename SS-N-26 "Strobile". Development officially started in 1983, and in the 1990s the anti-ship missile was tested on the Project 1234.7 ship. In 2002 the missile passed the whole range of trials and was commissioned. It is reportedly a replacement of the P-270 Moskit, but possibly also of the P-700 Granit. The P-800 was used as the basis for the joint Russian-Indian supersonic missile BrahMos. The missile is carried in flight by aerodynamic lift. The solid-propellant booster is located in the ramjet's combustion chamber and is ejected by the airflow after it has burned out. In 2010 Sergei Prikhodko, senior adviser to the Russian President, has said that Russia intends to deliver P-800 to Syria based on the contracts signed in 2007. Syria received 2 Bastion missile systems with 36 missiles each (72 in total). The missiles' test was broadcast by Syrian state TV. In May 2013, Russia continued the contract delivery to the Syrian government supplying missiles with an advanced radar to make them more effective to counter any future foreign military invasion. The warehouse containing the Bastion Missile was destroyed in an Israeli air strike on Latakia on 5 July 2013, but US intelligence analysts believe that some missiles had been removed before the attack. Oniks missiles were used in 2016 against ISIS targets. 3M55 Oniks – Base version for Russia. P-800 Yakhont – Export version of Oniks. P-800 Bolid - Submarine-launched version of Yakhont. Brahmos – Co-developed by Russia and India, based on Oniks, produced by BrahMos Aerospace Private Limited in India. BrahMos-II, a hypersonic version is also being developed. Bastion-P – Coast mobile missile system. Officially it was entered service in 2015. Kh-61 - Air launched air to surface version. Hezbollah – with diverse launching platforms. Indonesia – 4 VLS (vertical launching system) mounted on Ahmad Yani class frigate KRI Oswald Siahaan (354). Russia – 3 "Bastion-P" complexes delivered in 2010, all the complexes taken into service with the Russian Black Sea Fleet's 11th Independent Coastal Missile-Artillery Brigade stationed near Anapa and the Project 1234.7 Nakat, a one-off Nanuchka IV-class corvette commissioned in 1987 with 2x6 Oniks. The "Bastion-P" is deployed by Russian forces in Crimea. One more Bastion-P was delivered in 2015. 2 Bastion systems are in service with the Northern Fleet and at least one with Western Military District (Baltic Fleet). Two more systems entered service in 2016 with Pacific Fleet. Newest class of Russian nuclear-powered attack submarines, Yasen-class submarine, can also launch the missile. Submarine-launched variant entered service in 2016. Two Bastion missile systems delivered in 2017 and one more in 2018. Totally 4 Bal and Bastion systems in 2018. One more system delivered for the Pacific Fleet in early 2019. Syria – 2 "Bastion-P" complexes delivered in 2011, 72 missiles. Vietnam – 2 "Bastion-P" land-based coastal defense systems delivered, 40 missiles. ^ "MIC "NPO mashinostroyenia" - History". Retrieved 23 December 2014. ^ "Nakat". Retrieved 23 December 2014. ^ "Brahmos Missiles - The Hans India". www.thehansindia.com. Retrieved 22 November 2015. ^ "BBC News - Syria crisis: Russia 'sends sophisticated weapons'". BBC News. Retrieved 23 December 2014. ^ "Despite Israeli protests, Russia won't halt arms sale to Syria". Haaretz.com. 30 August 2010. Retrieved 23 December 2014. ^ "Bastion missile systems to protect Russian naval base in Syria". Retrieved 23 December 2014. ^ "Syria Navy with Yakhont missile.flv". YouTube. Retrieved 23 December 2014. ^ "BBC News - Syria crisis: US rues Russian missiles sent to Damascus". BBC News. Retrieved 23 December 2014. ^ Gordon, Michael R.; Schmitt, Eric (16 May 2013). "Russia Sends More Advanced Missiles to Aid Assad in Syria" – via NYTimes.com. ^ Gordon, Michael R. (31 July 2013). "Some Syria Missiles Eluded Israeli Strike, Officials Say". New York Times. ^ Litovkin, Dmitry (8 August 2013). "Russian supersonic missiles behave like wolves". ^ "ВПК "НПО машиностроения" - Новости". ^ Amos Harel and Gili Cohen: Hezbollah: From terror group to army, Haaretz, 12 July 2016. Quote: "Hezbollah now [as compared to 2006] has Yakhont missiles with a longer range, better precision and diverse launching options." . Retrieved 13 July 2016. ^ Koh Swee Lean Collin (31 May 2011). "Indonesia's Anti-ship Missiles: New Development In Naval Capabilities – Analysis". Eurasia Review. Retrieved 11 March 2014. ^ "Ракетный комплекс "Бастион" будет защищать берега Анапы". Retrieved 23 December 2014. ^ Wertheim, Eric (2007). The Naval Institute Guide to Combat Fleets of the World: Their Ships, Aircraft, and Systems. Naval Institute Press. p. 625. ISBN 9781591149552. ^ "Russia parades Bastion-P in Crimea". Retrieved 23 December 2014. ^ "ЦАМТО / Новости / В Национальном центре управления обороной страны под руководством С.Шойгу прошел Единый день приемки военной продукции". ^ Sputnik. "Russia's Northern Fleet Receives New Bastion Coastal Defense Systems". ^ "Russian Navy received more than 100 Kalibr, Onix missiles in 3rd quarter". ^ "Sputnik Images media library". ^ Sputnik. "Message for Tokyo? Russia Deploys Bastion-P Coastal Defense System in Kamchatka". ^ "Russia's First Yasen-Class Submarine is Combat-Ready". ^ "Advanced anti-ship cruise missile systems enter service with Russian Navy". ^ "Lenta.ru: Наука и техника: Россия поставила Сирии противокорабельные комплексы "Бастион"". Retrieved 23 December 2014. ^ Haaretz (1 December 2011). "Report: Russia delivers supersonic cruise missiles to Syria". Haaretz. Retrieved 1 December 2011. ^ "/ / «»". 24 October 2011. Retrieved 23 December 2014. ^ "Indonesia's Anti-ship Missiles: New Development In Naval Capabilities - Analysis". Eurasia Review. Archived from the original on 6 June 2011. Retrieved 23 December 2014. This page was last edited on 14 March 2019, at 16:31 (UTC).